Are These the 10 New TV Comedies Most Likely to Succeed? Today we’ve got comedies for you. We’re interested in Watchlist because of its predictive powers; the Watchlist community (with more than 1.1 million people signed up, according to TVGuide.com, up from half a million when we first wrote about it) serves as a massive focus group of informed and committed TV viewers. If Watchlisters are excited about a show, that, historically speaking, has typically translated into respectable viewership. The most conspicuous sitcom trend this year, notes O’Connor, is the return of established comedy stars. “CBS is bringing lovable spaz — and Oscar winner! — Robin Williams back to TV with ‘The Crazy Ones.’ NBC’s ‘The Michael J. Fox Show’ puts the star’s even-keeled struggle with Parkinson’s front and center. 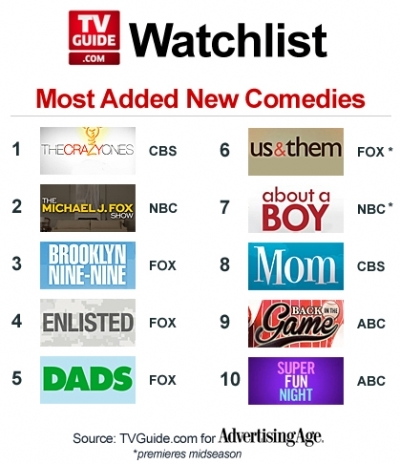 And Fox’s ‘Brooklyn Nine-Nine’ gives us ‘SNL’ goofball Andy Samberg as a wisecracking cop.” Thanks to all that comedic star power, those three shows have a lock on the top three spots on our chart.